Review by AllTheBestFights.com: 2017-12-02, nice and tough fight between Max Holloway and Jose Aldo 2: it gets three stars. The Ufc Fw champion Max Holloway entered this fight with a professional mma record of 18-3-0 (56% finishing rate) and he is ranked as the No.1 featherweight in the world. He suffered two consecutive defeats in 2013, against Dennis Bermudez and Conor McGregor (=McGregor vs Holloway), but then he has won eleven consecutive bouts beating Anthony Pettis (=Holloway vs Pettis) and Jose Aldo in his last two (=Aldo vs Holloway I). His opponent, the black belt in Brazilian jiu-jitsu and former Ufc Fw champion Jose Aldo, has an official record of 26-3-0 (62% finishing rate) and he entered as the No.2 in the same weight class. Before losing to Holloway he had lost to Conor McGregor in 2015 (=Aldo vs McGregor) and he had beat Frankie Edgar in 2016 (=Edgar vs Aldo 2). 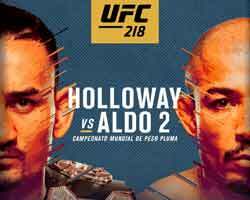 Holloway vs Aldo 2, main event of Ufc 218, is valid for the Ufc featherweight title. Watch the video and rate this fight!